Welcome to Bridge Street Theatre, a new performing arts venue in Catskill, NY. Bridge Street Theatre, Inc. is a non-profit corporation which purchased the factory building at 44 West Bridge Street in Catskill, NY in late 2013. We have now converted the building into a 84-seat theatre which houses our own theatre productions. It will also be available to other theatres and performing arts groups, and because of its location adjacent to Catskill High School, will be able to provide theatrical opportunities for high school and middle school students. We received a grant from New York State’s Homes and Community Renewal to convert our black-box Raw Space into our fully functioning proscenium theatre, and in September of 2016 we presented our first production in the new theatre, THE TAVERN. We’ve also converted the lobby of the theatre into the Speakeasy where we have presented over 40 events — theatre, music, magic and more — and outfitted our Big Room into an exhibition space where we showcased a monumental balloon sculpture called AVIARY (reimagined) and Big Works in the Big Room. To see what we’ve done already click on ARCHIVES on the Menu. Click on COMING UP for the upcoming events at Bridge Street Theatre. We have amazing individuals and organizations that have contributed to our success. Click here for a list of all our 2017 DONORS. 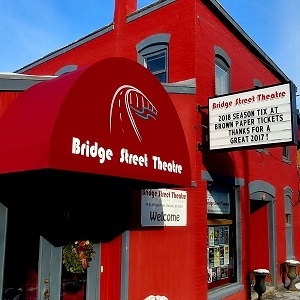 Events at Bridge Street Theatre are supported in part by the New York State Council on the Arts with the support of Governor Andrew M. Cuomo and the New York State Legislature and by Public Funds from the Greene County Legislature through the Cultural Fund administered in Greene County by the Greene County Council on the Arts. A large central space in the original part of the building which houses public restrooms and a fully equipped 84-seat proscenium theatre. A separate entry area which serves as the main lobby and can be used as a venue for small scale theatrical productions, cabaret performances, play readings, rehearsals, training activities, film showing and community events. A very large warehouse that has been used for art installations (including AVIARY (reimagined) and Big Works in the Big Room) and could potentially be developed in the future as a larger main stage theatre or a sound stage for film. The building is in an area which the Village of Catskill is eager to develop and improve. It also borders on the parking lot of Catskill High School. Both the village and the school district administration are enthusiastic about the potential that the presence of the theatre offers. In 2014 we remodeled the future lobby of the theatre, put in a small stage and christened it the Speakeasy. Starting in April we presented over 20 performances there of music, magic, and theatre. In 2015 we built public restrooms and created a black box performing space (the “Raw Space”) in which we presented our first major productions. In 2016 we offered a subscription series of six shows and using a $105,000 grant from New York State Homes and Community Renewal we have created a fully-equipped theatre (the Mainstage) and inaugurated the space with our production of George M. Cohan’s “The Tavern.” In 2017 we presented a full season of theatre, music, dance and more. For details about all our past shows, click on the ARCHIVES on the menu. John Sowle and Steven Patterson first met during a production of C. D. Arnold’s King of the Crystal Palace at Theater Rhinoceros in San Francisco in 1983 in which Steven was playing the title character and John was designing the lights. They founded a production company called Kaliyuga Arts in 1986 in Los Angeles and have been producing theatre together ever since. The company produced shows in Los Angeles, San Francisco and New York City and their productions have toured all over the US, Canada and in Europe. With the purchase of the Catskill building, Kaliyuga Arts is now Bridge Street Theatre. During times when Bridge Street Theatre is not actively involved in presenting its own productions the theatre space will be available for other performance activities, including (but not limited to) theatre, dance, and music. There are really no venues of our size in the Catskill area, or even in all of Greene County, so we anticipate that the theatre will become a popular venue for other performing artists in the area (and beyond) who have no home of their own. All ticket sales and donations are final. There are no refunds available.